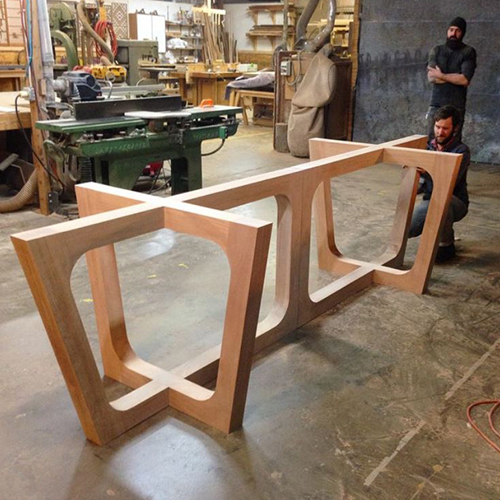 A self-taught woodworker and designer, Michael has been producing fine furniture since 2003 for a wide range of clients – from architects and interior designers to restaurateurs and homeowners. Known for his high level of craftsmanship, comfort, and attention to detail, he is consistently adding to his catalog of products. All work is handmade by Michael and other skilled artisans in Brooklyn, NY. While everyone has different aesthetic taste, I believe that when someone chooses to purchase our work that we have an obligation to deliver the best possible version of that product, every time. For this reason we are not only working to develop elegant and versatile objects, but we are also in constant pursuit of optimum usability and comfort. Over the past fifteen years we have refined our designs and processes so that we can produce fine objects equally well in a quantity of one or twenty. It is our hope that these objects will be well used, and that they will become an important part of your daily rituals and fondest memories. Please feel free to write us and share your thoughts or any questions you may have about the work, materials, people, or process. A few years ago, I had the privilege of building my grandmother’s casket, at her request. Here are two videos that tell the story — the video on the left was filmed in front of a live audience, and on the right is a “making of” story produced during the process. It's nice to be recognized for the work that we love doing, and of course it is important for us to get our work out in front of new audiences from time to time. Here are a few of the publications that have featured us. We are grateful.